‘That’s a Bansky,’ I said. ‘I think it is,’ I said. Then we noticed there was perspex protecting the piece. 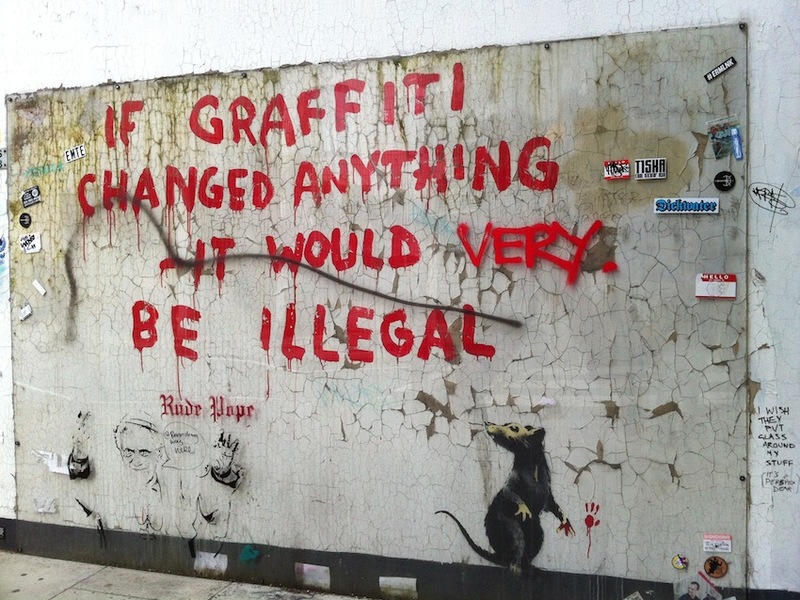 Which is kinda ironic, given the message – ‘IF GRAFFITI CHANGED ANYTHING -IT WOULD BE ILLEGAL’. The image – which apparently appeared in Fitzrovia in 2011– has attracted further graffiti, including the badly placed ‘VERY.’ and a sarcastic exchange about said perspex. The selection of spectacular street art below is stuff we came across in Spitalfields, well worth clicking on to get bigger images. Below are pieces, old and new, from various places around the city. This entry was posted in Marie-Louise Fitzpatrick, Michael Emberley and tagged Banksy, graffiti, London, Spitalfields, street art by The Belugas are Watching. Bookmark the permalink. That was a wonderful day! I loved all that Spitalfieds street art. And thank you for posting the “bakers” shot. I remember wanting you to take it because my phone battery had run down…….